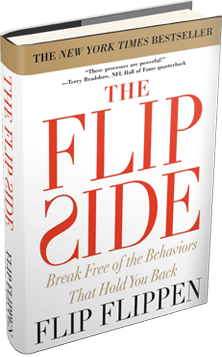 Hi, I’m Flip Flippen! I’m the New York Times best-selling author of The Flip Side, and I’m a philanthropist, an entrepreneur, and I’m also a cowboy. I love history, and that’s what makes me think about today in 1620 because it’s all about Thanksgiving. I could talk to you about Thanksgiving and the history. They didn’t have turkey; they had swans. They didn’t have any sugar; they had run out, so there weren’t any of those pies and things that we think about. But that’s not what I want to talk to you about. What I want to talk to you about is this…this is it. These are the things I’m thankful for. These are letters that I get from teachers and kids all over the country. I get them every day! I got one the other day from Mat-Su, Alaska. In fact, I got a bunch of them. One kid just said,” You know, this whole program is life-transforming; it’s a transformative event.” I need you to know I’m not transformative, that’s what I want to be, but you guys are transformative. I build processes, but you execute them. You’re the people that take it to children. I just look at everything that’s going on right now in our life, and I just have to tell you that there’s so much to be thankful for. Every day has got so many special things to attend. I want to celebrate those days! So, Thanksgiving is coming. I wish for you a full table – I really do – a very full stomach. But more than anything in the world, I want your heart to be full. For you guys that are touching kids’ lives, you’re changing the world. I know you hear that all the time and it sometimes doesn’t sound anything other than just a trite statement or something you’d say in passing, but from me and from all the kids I hear from, and the teachers and educators I hear from all over the world, I cannot thank you enough. My whole life, everything I own, every place I have been, the people I know, the books I’ve written, everything in my life, I owe to my teachers and I’m thankful for you! I am thankful for you because you write on the souls of children. I hope it’s not presumptuous, but I love you guys. I love what you do. I love who you are. Y’all have a great time, and be sure and overeat!